Book Review: In the Presence of My Enemies | In the Key of "H"
I regularly check Tim Challies blog for kindle deals. He has them almost every day. 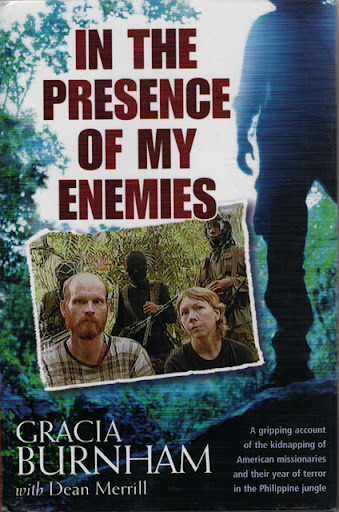 On many occasions I find books for under 4 dollars, and every so often I’ll get one for free such as In the Presence of My Enemies by Gracia Burnham. At first I feel a little weird about reviewing a book I paid nothing for, but then I realized, several of the books I’ve reviewed have actually been sent to me by the authors for free so that I would review them. Most of the “professional” reviewers do this anyway. Although this is a non-commissioned book review, I promise the cost of the book did not lower my expectations the way Net-Flix streamers tend to lower their expectations when browsing the plethora of “free” B quality movies. For those unaware of the Gracia Burnham-which was me before I read the book-she and her husband Martin were missionaries with New Tribes Missions in the Philippines. Martin served as a pilot and Gracia did everything else besides flying, often even serving as air traffic controller. While vacationing away from their children on a nice anniversary trip, a militant Islamic group called the Abu Sayyaf kidnapped the Burnhams along with a number of other vacationers. In her introduction, Gracia acknowledges the fact that she wants to honor her husband Martin. That should tip off the reader that the story does take a sad turn before her rescue. It saddened me greatly, as I got to know this couple and loved them even more with each click of the arrow button. I found the writing simple but engaging, enjoyable, and painted all the picture I needed to get a grasp of what it would be like to be kidnapped by a gang of incredibly self-righteous yet hypocritical militant muslims. What would it be like for you and your three children? You miss a whole year of their lives while they wait and pray they will see you again. Unbelievable. But there remains yet another battle beyond the homesickness, kid-sickness, uncomfortabilty and uncertainty: God-sickness, or rather “sick” with God. What do you do with a God who doesn’t answer your prayers for rescue? Well at least not for 15 months and then you only get half your prayer answered. She details her struggle and how Martin walked with her through the dauting jungle of doubt and despair. Theologically I give it two different grades: one for the applied theology, another for her stated theology. In regards to applied theology, the Burnhams clearly demonstrate a powerful grip on their sin and the gospel. Gracia recognizes her own sin in new and deeper way. It is only through this recognition, and the concomitant deeper picture of the gospel she embraces, that she begins to have love her enemies. Very challenging stuff and they get an A+ for applying the theological truth of depravity and need for grace. When it comes to a stated theology, I give her a B-. How do you reconcile God not answering your prayer for deliverance (or rather answering with a “no” which He is OK doing), or for God allowing such evil like the Abu Sayyaf in the world? Free-will. God will not violate someone’s right to be completely autonomous. She compares this “hands off” approach with the way America desired to perform the rescue operation, but yielded to the Philippines. The latter had right of first refusal and they wanted to do it their way. America had to respect the Philippines’ rights as a sovereign nation and would not exert its will. As a result, the Phillippinos came in with guns a-blazing in the middle of the day and accidentally shot all three hostages. Gracia alone survived the rescue attempt. That’s not the God of the bible. At least how I interpret it. What made this analogy so saddening, if not befuddling, is that Gracia clearly gets the depths of the sin which has made its home deep in her heart. Yet I don’t think she follows through with its implications. If a Christian is that sinful, and needs God to intervene on his/her behalf (isn’t that what prayer is? ), is it that much of a stretch to realize non-Christians need God to do the same thing for them? And that if he doesn’t, they remain dead in their sins (Ephesians 2:5-6). While she didn’t connect the dots like I had hoped, I would only hope that my applied theology would be one third of hers. Of course, God is the only one who can make us love our enemies. So to Him be the glory and to us be the encouragement! I highly recommend this book to you. We can read about WHY we should forgive. We can read about WHO and HOW to forgive. But there is something quite powerful to see WHEN people forgive and love their enemies. I’m encouraged and challenged the most when I SEE the gospel change people. You’ll see it here. It will renew your hope that people like you and I can love our enemies. This entry was tagged book reviews, Forgiveness. Bookmark the permalink.